Applications include blast hole, construction, water well, environmental, and exploration. The Mincon 6DH has proven itself the best hammer on the market in all kinds of demanding conditions and applications. 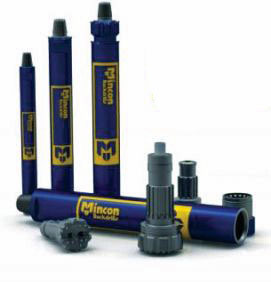 The Mincon 6DH delivers superior penetration rates versus other manufacturers with extremely smooth drilling. Design allows for increased penetration against large volumes of water, and also allows for the introduction of more water in unstable conditions. Multiple splined shank reduces possibility of shankage. Like all Mincon DTH hammers, the Mincon 6DHSD6 maintains an excellent operating pressure over an extended service life and overall is the tool you require to get the maximum out of all your equipment. Mincon products are all manufactured in house (Ireland) and all processes are carried out under one roof. This guarantees that the quality you expect is always delivered. The Mincon 6DH-LV (Low Volume) has proven itself the best hammer on market in all kinds of demanding conditions and applications. It is still the fastest, smoothest, longest lasting, and reliable hammer around. Internal stroke modifications better utilize air in low-pressure air packages. Now with new performance enhancements, the Mincon 6DH can provide better drilling in soft ground conditions and against large volumes of water. Multiple splined shank reduces the possibility of shankage. The Mincon 6DH360 has proven itself the best hammer on the market in all kinds of demanding conditions and applications. It is still the fastest, smoothest, longest lasting, and reliable hammer around. Now with new performance enhancements, the Mincon 6DH360 can provide better drilling in soft ground conditions and against large volumes of water. Like all Mincon DTH hammers, the Mincon 6DH360 maintains an excellent operating pressure over an extended service life and overall is the tool you require to get the maximum out of all your equipment. Mincon products are all manufactured in house (Ireland) and all processes are carried out under the one roof. This guarantees that the quality you expect is always delivered. Hardened wear sleeve for optimum wear resistance ven in themost abrasive conditions.